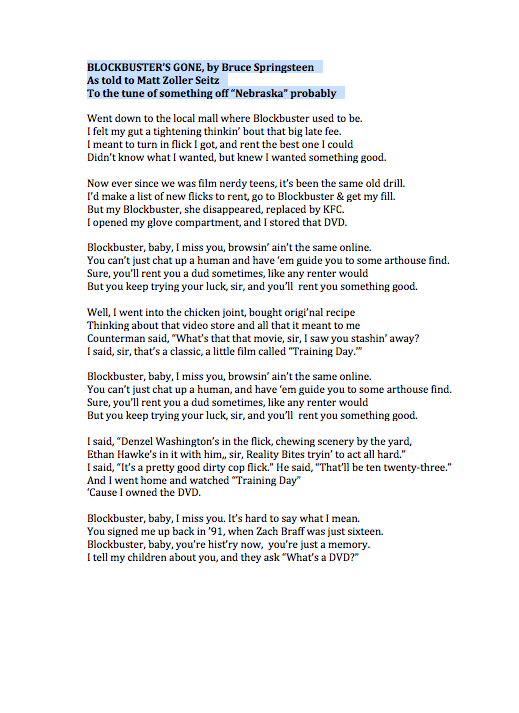 That stray reference by my pal Lincoln Flynn somehow led to a whole songbook of laments for Blockbuster. As you probably heard, the onetime juggernaut of a video rental chain formally pulled the plug on most of its remaining retail stores this week. Just think of all those abandoned storefronts where people used to rent "Wall Street 2" or "Pain and Gain" or whatever; just think of what Bruce Springsteen, the bard of economic collapse, might have done with such a...well, I was about to type "catastrophic occurrence," but if you ever set foot in Blockbuster, you know that's not exactly what it was; it was more like a sector of the marketplace realigning itself with technological reality after years of denying the inevitable. Which, granted, is not verbiage that Springteen would ever use in one of his Death of the American Dream songs—he'd probably restate all that in plain language, drop some g's, maybe work in a "Well" or a "Sir" to make the meter work—but whoa, hey, look, what have we here? Why, it's a bunch of Bruce spoofs. I published this online a couple of days ago, and other people got into the act. 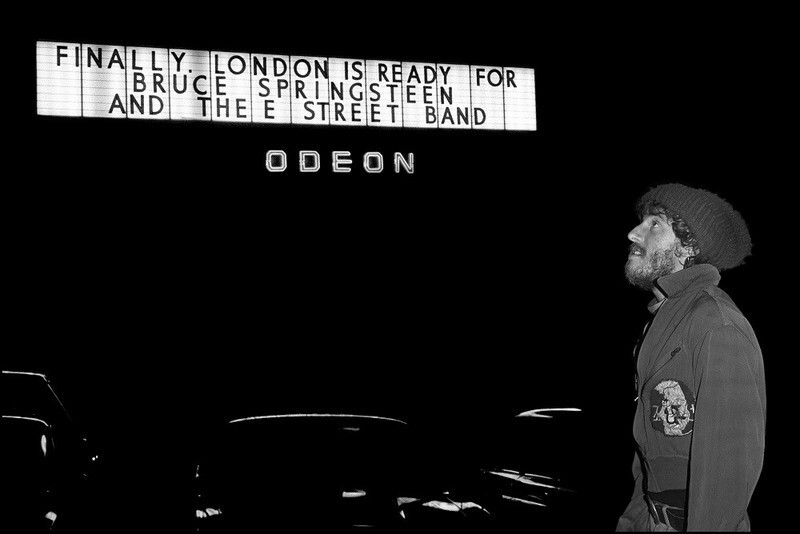 I've included a selection of their Bruce-mourns-Blockbuster songs here. Feel free to add your own in the comments! All the Netflix pretties took command. At the Blockbuster Store Closeout! And 3000 stores up and died. Gonna put it in my Netflix queue. But there's no bandwidth that can hold our grief. Maybe everything that dies some day comes back. When Friday night came we did the best that we could. Cinephiles for miles just found the choices lackluster. A main stream's still a stream when drownin's all that you can muster." Ended up with a Steven Seagal flick, and a box of Junior Mints, yeah. "We ain't got that movie in stock"? To that old video store. As we take our snark down to streaming land…. Make you feel like a fool. Twenty more minutes 'til I hit rewind. Paradise glowin' with a movie-ticket sign. Blockbuster's empty now and nowhere to hide. Netflix queue's got sumthin' to see. Goin' home, now, my baby and me. Streamin' killed the video store in twenty-one-three. Strangled him right there in line. Judge says "Boy, you done your time." And Johnny's got Amazon Prime. This is video nowhere, is there anybody alive out there? I just want to see some horror. I wanna find out what Godards you got. Last Temptation of Christ! Tie Me Up, Tie Me Down! Evil Dead 1, 2, and 3! All movies I wanted to see! Daddy, what was a video store? Said "It'll be alright, you don't have to pay those late fees." To say goodbye and know, just what was gone in the this old thing I've lost. Is that you, 'buster, or just a brilliant demise. I saw packets tucked in shame, underneath your pillow. How this math can add up, to a company.